The new LG V40 ThinQ easily captures three photos – standard, telephoto zoom, and super wide-angle – with just one click, LG announced. Body: Aluminum frame with Gorilla Glass 5 on front and rear; MIL-STD-810G transit drop test compliant; IP68 rated for dust and water resistance. Screen: 6.4″ QHD+ FullVision OLED; 19.5:9 aspect ratio with a notch (LG calls it ‘Second screen’), 537ppi; HDR 10 support. Camera: Primary: 12MP, 1.4µm pixel size; f/1.5 aperture, 78-degree FOV lens, 25mm equiv. focal length, OIS, dual pixel PDAF; Ultra wide-angle: 16MP; f/1.9 aperture, 107-degree FOV lens, 16mm equiv. focal length, fixed focus. Telephoto: 12MP; f/2.4 aperture, 47-degree FOV, 50mm equiv. focal length, 2x zoom, PDAF. OS: Android 8.0 Oreo with LG UX, Android P update expected. 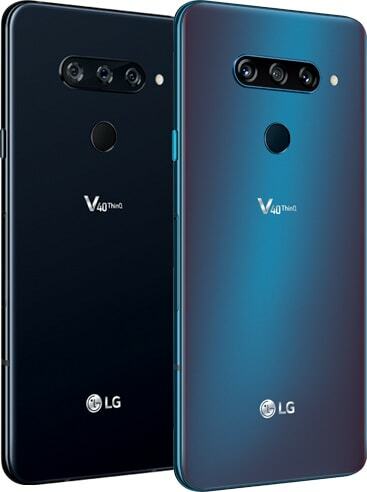 The LG V40 ThinQ is now available for purchase.